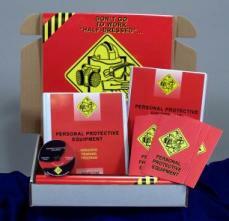 MARCOM's "Personal Protective Equipment" Regulatory Compliance Kit™ has been created specifically to involve employees in the process of understanding the proper use of personal protective equipment and to help facilities in fulfilling OSHA's Personal Protective Equipment Standards (29 CFR,1910. 132,133,134,135,136,137,138) training requirements. Materials in the kit include 30 employee booklets, 5 motivational posters, and a compliance manual. "On-the-job" injuries affect all types of people doing all types of work. Each year hundreds of thousands of workers are injured... at a cost to employers of billions of dollars annually. Government surveys show that the most common cause of workplace injuries today is due to employees not using personal protective equipment (PPE) as they work. Virtually everyone will experience one or more "on the job" injuries during their working life. In most cases appropriate equipment is readily available, yet employees do not recognize the need for this equipment, or take the time to use it. The compliance manual provides a detailed summary of the information needed to comply with the OSHA Standard, as well as a complete "fill-in-the-blank" written PPE program. The posters in the kit remind employees to use PPE to avoid injuries. The videotape and employee booklets include information on the review of OSHA's Personal Protective Equipment (PPE) Standards, PPE for eye and face hazards, PPE for respiratory hazards, PPE for head hazards, PPE for foot hazards, PPE for electrical hazards, PPE for hand and finger hazards, and more! The video program in the kit comes with a comprehensive leader's guide, reproducible scheduling & attendance form, employee quiz, training certificate and training log.